The Zo 3-Step Peel is a powerfully effective method of treating fine lines, sun damage, dull skin, Melasma, acne, and uneven texture concerns. It is safe and effective for any type of skin and has been demonstrated to have some of the most effective and long-lasting results in the industry. ZO 3 – Step Peel is an innovative, in-office treatment peel followed by an at-home treatment to combat the signs of aging + skin discoloration. The treatments utilizes a blend of exfoliants, retinol and multi-action agents to help improve skin health and treat many signs of aging. The special formulation provides antioxidant protection as well as anti-irritant benefits. One of the major issues with cosmetic treatments is that patients don’t continue to care for their skin once the procedure is over. This leads to a cycle of getting cosmetic treatments to solve aesthetic concerns, the skin worsening due to neglect and a lack of care until these concerns crop up again, and another treatment being done. 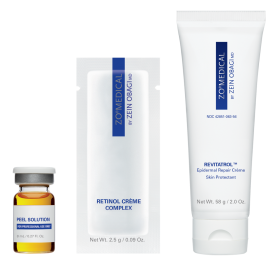 Zo Skin Health 3-step Peel breaks this cycle by including a skin creme to help promote ongoing health. Why Is The Zo 3-Step Stimulation Peel Different? 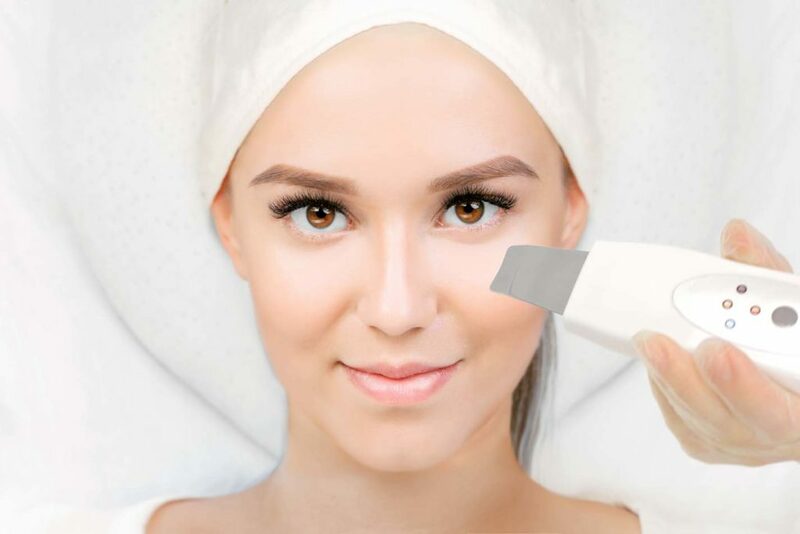 The 3-Step Stimulation Peel is in line with the Obagi philosophy that focuses on ongoing skin health, and therefor provides benefits that continue well after the treatment Is done. Unlike other treatments that simply deal with the symptoms, this incredible system helps to strengthen and bolster healthy skin. Where can this treatment be used? The Zo 3-Step Peel can be used on most parts of the body, including the chest, arms, legs, neck, and face. One peel is enough to deal with most dermatological complaints, but those in need of deep healing can get additional treatments 3-4 weeks apart. What is the process for using Zo 3-Step? 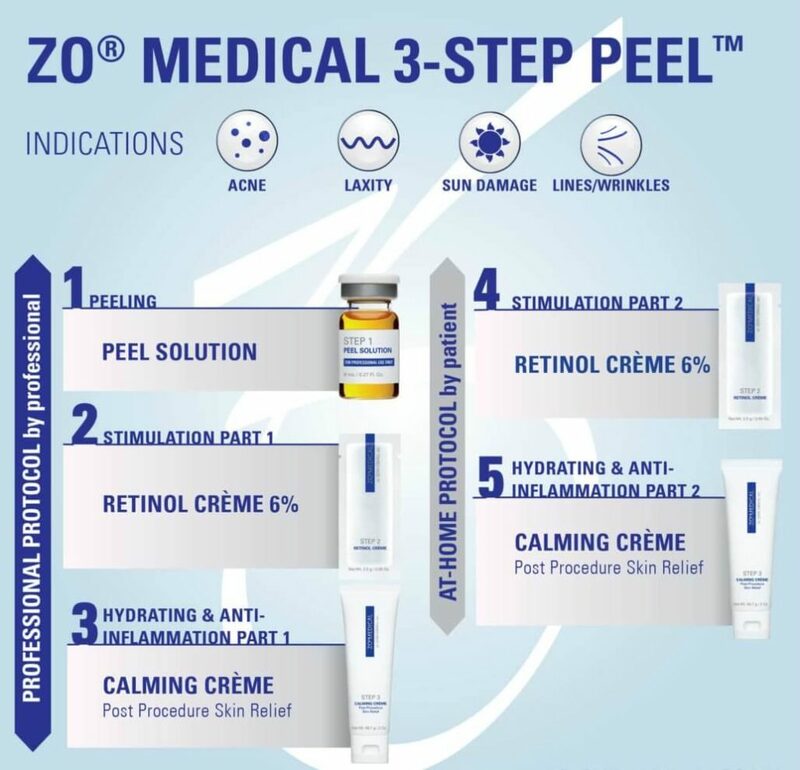 There’s a three step process for applying and benefiting from the Zo 3-Step Peel. The first step involves the application of a peel solution to the skin. This solution is made from 5% lactic acid, 17% salicylic acid, and 10% TCA. The second step is to apply the 6% Retinol Creme which can now penetrate even deeper thanks to the peel. Retinol stimulates the reduction of wrinkles and firms and tones the skin while helping to even out irregular pigmentation. The ubiquinone component contains two anti-oxidants, marrubium vulgare and leontopopdium alpinum meristem, as well as beta-glycan which helps to protect your DNA. These components help to encourage the cells to regenerate. The final step involves the ongoing application of the Calming Creme that stimulates the production of collagen and hyaluronic acid while serving as a barrier against the elements. The Zo Health 3-Step Stimulator Peel is working hard after the process is completed, and you’ll feel a roughness to your skin that will last for up to 48 hours after the treatment. During the third and fourth days your skin will begin shedding dead cells that will slough off leaving your skin feeling smooth and refreshed. The final results will occur within 6 weeks, but improvement will start being apparent at the 2 week mark. Continued use of the product will continue to help smooth the skin, diminish red spots, and help smooth out fine lines and wrinkles.